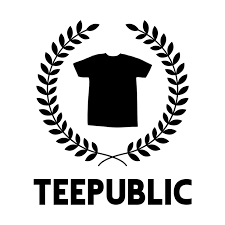 So for each of these posts, I will write a present-day review and then copy/paste the original review after. Then I’ll compare the two and give a summary at the end. You can find all the reviews here, follow me on Twitter here and check out The Obsessive Viewer Podcast here. Now, lets talk about Throne of Blood. 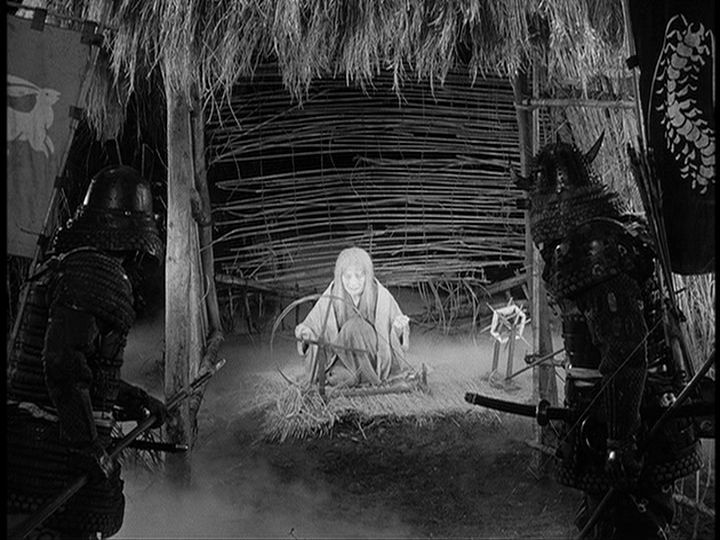 Throne of Blood is Akira Kurosawa‘s 1957 adaptation of Shakespeare’s Macbeth, transposed to medieval Japan. 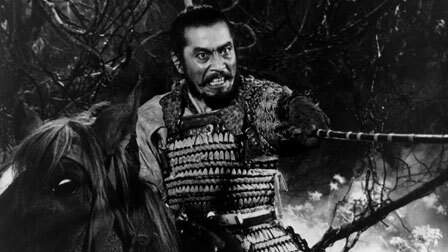 Toshirô Mifune plays Taketoki Washizu, a hardened general who, along with his friend Yoshiaki Miki (Minoru Chiaki), encounters a spirit in the forest surrounding “Spider’s Web Castle”. The spirit shares a prophecy with the two men, saying (among other things) that Washizu will become the lord of Spider’s Web Castle. Washizu is then provoked by his ambitious and ruthless wife Lady Asaji (Isuzu Yamada) to fulfill the prophecy. Being that it’s an adaptation of Shakespeare, the movie has a certain theatre quality to it. Certain scenes, particularly the ones with Washizu and Asaji, are framed in a way that makes you feel like you’re watching a stage play. It works really well in the movie’s favor, as it breathes a bit more life into the macabre tone of the story and performances. Mifune is terrific as Washizu. He wrestles with the ideas his wife puts into his head with intensity. There were moments throughout the movie where Washizu is outright terrifying. Mifune plays these moments big and full of energy, to the point of nearly over acting. But it works well as an indicator of him losing his grasp with sanity. Isuzu Yamada’s performance as Lady Asaji stands out as her dialogue is filled with eerily vacant delivery. She constantly avoids eye contact with Washizu and sounds vaguely like a spirit herself. It’s an eerie performance that really drove the movie home for me. Throne of Blood is shot incredibly well. When I was a teenager, I bought a lot of Kurosawa’s works on DVD and always found myself favoring his period pieces. With this movie, you can see the detail that went into creating its aesthetic. According to the IMDb trivia section for Throne of Blood, Kurosawa intended to build castle facades for the sets but he scrapped that idea and decided to build full castle sections to shoot in. The detail that went into the construction really shows and lends itself to the overall tone of the movie. Kurosawa put a lot of care into making this movie unsettling. The characters’ interactions with the spirit in the forest are unnerving as the spirits glow, change shape and speak in highly distorted voices. 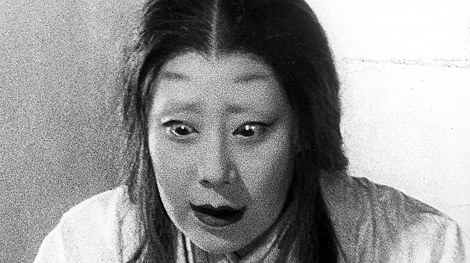 Washizu sees an apparition in one scene that drives him nearly to insanity. The apparition stares vacantly and is bathed in a white light that pops out of the black and white picture. There’s some intense violence and scenes depicting the aftermath of violence. One shot that’s particularly gruesome shows someone with an arrow through his throat. Throne of Blood is an unsettling period piece from Kurosawa that brings Shakespeare into medieval Japan. This sets it apart from other Kurosawa period movies and gives Throne of Blood an unnerving feeling that will stay with you. I cannot recall the last time I viewed so many films by one filmmaker in such short of a time period and still craving more of the man’s work. “Throne of Blood” is the seventh Akira Kurosawa film I have viewed in around two months. It is an adaptation of William Sheakespeare’s “Macbeth” told with a feudal Japan setting. Washizu and Miki are two warriors who are returning to their emperor’s castle to receive praise on their achievements in battle. They become lost as a storm rains down on them. They encounter a mysterious old woman who predicts great things in both of their futures. When they finally arrive at the castle the prophecy begins to come true as they are both promoted accordingly. Washizu, at the encouragement of his wife, quickly decides to fulfill the prophecy himself and thus begins his bloodied ascent to power. The story is told with the Kurosawa’s classic style of filmmaking. He uses a thick fog that is present throughout the film to add to the murkiness of the story. The scenes with the evil spirit in the fortress who predicts the men’s destinies are incredible. The fog combined with the the [sic] spirit’s eerie presence is very effective at getting underneath your skin. Washizu’s rise to power is swift and engrossing as is his tragic downfall. Toshiro Mifune never ceases to impress me with his vast range in his various roles under the direction of Kurosawa. Having just seen “Stray Dog” yesterday I can clearly see the growth in his acting between the two films. In “Stray Dog” he was fairly young and new, however still magnificent. In “Throne of Blood” he is more experienced but does not let it show. His performance is as commanding and transfixing as Kurosawa’s direction. The film makes me want to see more of their collaborating as well as their individual work. I am curious to see how the two men work without eachother. Overall, “Throne of Blood” is another Akira Kurosawa masterpiece to add to my personal list of favorites. It makes me wonder if the man was ever capable of directing mediocre films. I am eagerly awaiting my next Kurosawa movie-watching experience. Let’s deconstruct my 2004 review. There’s a small paragraph sandwiched between two massive paragraphs. Paragraph one is 8 sentences long with 6 being the movie’s synopsis and the other 2 being me bragging about the odyssey I’ve taken by seeking out the work of a director that’s really obscure to people my age. The middle paragraph is a respectable 5 sentences long and filled with really vague analysis of the movie. The first sentence, celebrating Kurosawa’s “classic style of filmmaking” (how so? What makes it a classic style aside from being made almost 50 years before I watched it? ), reads like I’m, again, bragging about seeking out Kurosawa’s work. I go on to say “The scenes with the evil spirit in the fortress who predicts the men’s destinies are incredible.” Why Matt? Why are they incredible? It’s pretty obvious from my 2004 review that I didn’t know what the hell I was talking about. But I still filled three oddly lengthen paragraphs because brevity, apparently, wasn’t in my vocabulary. I did genuinely like Throne of Blood, however, and I feel like seeing it ten years later made me pick up on some of the reasons I liked it. If I didn’t have anything worthwhile to say in 2004, though, I just shouldn’t have written anything at all. This entry was posted in Matt Hurt's Columns, Movie Reviews and tagged 8.0, Akira Kurosawa, Buy it Full Price, Decade Reviews, MacBeth, Shakespeare, Throne of Blood, Toshiro Mifune. Bookmark the permalink.